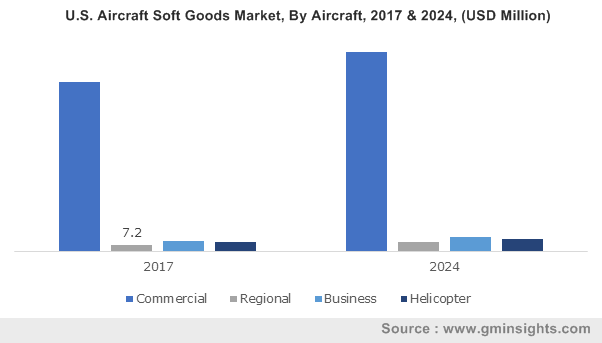 Aircraft Soft Goods Market size was valued at over USD 440 million in 2017 and is estimated to exhibit over 3% CAGR from 2018 to 2024. Rising adoption of interior improvement methods and the need to enhance the passenger comfort levels in airplanes will drive aircraft soft goods market during the forecast period. Need for noise absorbing, lightweight, and vibration dampening materials has enhanced usage of the product. Proliferating OEM activities to develop lightweight interior systems with excellent aesthetics will enhance the overall customer experience thereby driving the product demand from 2018 to 2024. Expanding aviation industry with a rise in the passenger traffic in conjunction with an increase in domestic and international airplane fleet has accelerated the new airplanes demand, leading to the use of soft goods including seat covers, carpets, and curtains. In 2017, the global commercial aviation industry had a production backlog of 17,018 airplanes and will require almost 10 years to overcome this at the current fabrication rate. Continuous airplane production will boost aircraft soft goods market share from 2018 to 2024. Ongoing refurbishment activity and cabin upgrades pertaining to first and business class in old airplanes to ensure safety and regulatory standards are escalating the product demand. Natural leather products are being replaced by synthetic leather offering an enhanced surface texture. Implementation of advanced materials, such as nylon fabric improving passenger comfort, will drive aircraft soft goods market size over the next seven years. Commercial aircraft soft goods market accounted for over 85% share owing to the substantial growth in the global aviation sector. Increasing air passenger traffic in conjunction with comfort levels in airplanes will drive the product demand. Business jets will foresee healthy growth owing to increasing usage of high-end leather fabrics for cabin interiors. Regional jets will witness a strong growth of over 6.5% in aircraft soft goods market during the forecast timeframe. This can be attributed to the increasing regional flight frequency and the shifting passenger preferences toward air travel. Rising cabin retrofit demand to improve the aviation standards and comfort will provide significant opportunities to the manufacturers. Seat covers will register a growth of over 3% in aircraft soft goods market from 2018 to 2024 owing to high demand for hygiene, low downtime, and easy cleaning offered commercial aircrafts. Rising demand for comfortable, lightweight and aesthetically-improved seats and armrest covers will further improve the product penetration. The requirement for excellent interiors in business jets and executive class in commercial airplanes will boost the business growth. Carpets aircraft soft goods market has a major share owing to large cabin floor space areas in airplanes. Rising spending capability has increased the air traffic. Consistent demand for commercial aircraft will further enhance the carpet demand in the aviation sector. Curtains will witness rapid growth owing to increasing aesthetic requirements in business jets and commercial airplanes. Wool/Nylon blend fabric segment contributed over 70% of the overall aircraft soft goods market revenue in 2017 and is projected to witness a strong growth owing to the superior material properties including water and wrinkle resistance, insulation, and durability. Nylon fabrics are blended with materials such as polyester to enhance elasticity and comfort. Their usage can be attributed to water wicking and quick-drying characteristics. Synthetic leather market is projected to generate a revenue of over USD 48 million in 2017 owing to factors such as stretch resistance, wear or breathe like leather, and low cost compared to natural leather. In addition, the puncture and tear resistant property of leather will fuel leather aircraft soft goods market. Other materials including polyester fabrics are at a nascent stage and will register a healthy growth owing to the durability and resistance to chemicals. OEM aircraft soft goods market will exhibit growth by over 3% from 2018 to 2024 owing to superior installation requirements of products including carpets, seat covers, and curtains in airplane interiors to meet the comfort levels. The revenue generation will escalate with a rise in long-term agreements to ensure a continuous supply of product. Aftermarket aircraft soft goods market will witness a strong growth with the rising demand for the replacement of old fleet with advanced and lightweight products. In addition, the development in stringent regulations requiring replacement of interior fittings will positively influence the product penetration over the next seven years. North America leads the aircraft soft goods market, generating around USD 250 million in 2017. The growth can be attributed to wide presence of airplane manufacturers in the region. Increasing production capacity of well-established aircraft OE including Bombardier and Boeing will fuel the industry growth over the forecast period. Europe led by Germany, France, and the UK will witness a significant growth owing to the rising air passenger traffic. Asia Pacific aircraft soft goods market will witness a CAGR of over 4% till 2024. This can be credited to growing commercial aviation industry and rise in refurbishment activities in old airplanes. The air carrier demand escalated by 9.4% in 2017 compared to 2016 owing to regional economic expansion and increase in travel route options. Aircraft soft goods market is fragmented with the presence of a wide number of industry participants. 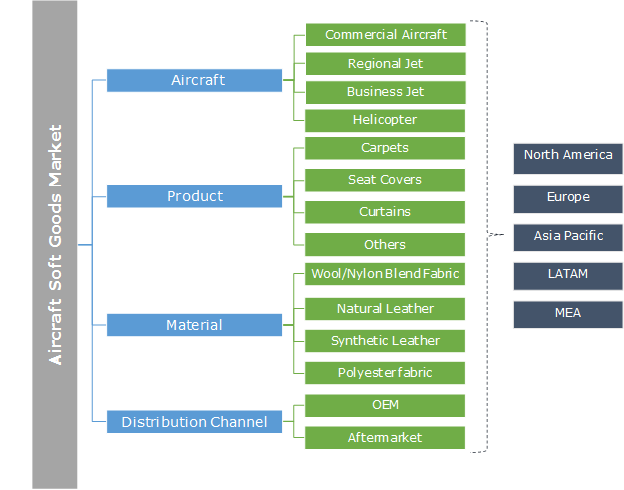 Few key players include Aero Floor, Aero Foams, Aircraft Interior Products, Aircraft Interior Solutions, Botany Weaving Mill Ltd., E-Leather Ltd., Fellfab, F-list, Mohawk Group, Hong Kong Aircraft Engineering Co. Ltd. (HAECO), InTech Aerospace, Desso Group, Lantal Textile AG, RAMM Aerospace, Spectra Interior Products, Tapis Corporation and The Anker Company. Companies are focusing on improving their product portfolio to enhance aircraft soft goods market share. In November 2017, Tapis Corporation developed BHC-SS flannel fabric that has been chosen for the new Emirates First Class Suites on Boeing 777-300ERs. Further, companies are undergoing strategic collaborations to fuel the industry share. For Instance, in April 2015, InTech Aerospace joined hands with Ranger AeroSystems to meet the expanding needs of overhaul and repair of commercial airplanes. Aircraft soft goods are used in airplanes to enhance the comfort level and the overall customer experience. The products help in improving interior aesthetics and making the airline more desirable. Federal Aviation Administration (FAA) guides the aerospace industry for the use of suitable materials in airplanes. FAA approves the material as per the ‘Transport Airplane Cabin Interiors Crashworthiness Handbook’ that provides testing requirements of the cabin materials to minimize the loss in case of accidents.